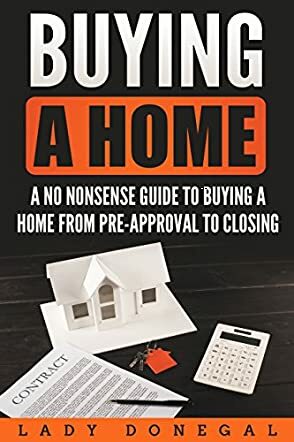 Buying a Home: A No Nonsense 20 Step Guide to Buying Your Home from Pre-Approval to Closing (First time home buyers, New Home, How to Buy a Home, Steps to Buying) by author Lady Donegal is a quick and straightforward reference for first time home buyers. With a clean outline of twenty chronological steps to the home buying process, Buying a Home covers all the basics, such as pre-qualification, document preparation, the loan process, appraisal, and closing the deal. Beyond this, there are also some helpful tricks and tidbits on possibly even locating a home in a desirable neighborhood before it hits the market, what to look for in an inspection, and some often overlooked key details in a home you may be considering. While not comprehensive, Buying a Home: A No Nonsense 20 Step Guide to Buying Your Home from Pre-Approval to Closing by Lady Donegal will certainly come in handy for buyers who are beginning to consider that home ownership might be a possibility for them. This is one of those guides that acts as a springboard so that first time buyers have, at the very least, an overview of some essentials, and perhaps a slightly more enhanced blueprint for turning what many may think is only a dream into a reality. One can never have too much information, but if the process feels overwhelming before it even begins, readers who do hope to become owners (even if it's not right now) may find some solace in this helpful manual.